So what is the best time to replace hydraulic hose assemblies? How often do they need to be switched out to ensure safety? Unfortunately, there is no simple answer. Hydraulic hose replacement depends on a variety of factors, including the type of machinery that it is being used with, the temperature of the hydraulic fluid, and other environmental influences. However, there are several signs that you can look for to determine when you should replace old hydraulic hoses. You can purchase all of your new Fall River hydraulic hoses through Metro Industrial & Marine Supply. We have a wide variety of hoses, couplings, and other equipment in stock, plus we also can create custom solutions on-site while you wait. Did you know that hydraulic hose assemblies have a shelf life, an expiration date? You can see the manufacturing date on the lay-line, which can be helpful if you have extra hoses lying around in the stock room. The Society of Automotive Engineers (SAE) safety guideline states that the general shelf life of bulk rubber hose is ten years from the date of manufacture. You should never put old hoses on your equipment. When it comes to hydraulic hose replacement, it is best to purchase brand new hydraulic hose assemblies in the correct size and type for your equipment from a trusted provider. It can save you both time and money to purchase a brand new hydraulic hose replacement than to use an old hose. When the old hose breaks – and it is practically guaranteed that it will – you will spend a lot of time cleaning up the mess. You will also have to still go out and buy a brand new hydraulic hose assembly to replace it. Also, damage could occur to your equipment, workers could get injured, and you will likely experience significant downtime in the process. Never use an old hose to replace old hydraulic hoses. While it might seem like a good temporary fix, it is never a good idea. The best way to ensure that hydraulic hose replacement is done at the right time is to establish a preventive schedule for your place of business. In most situations, a simple visual inspection is all that is needed to ensure that everything is in good working order. This should occur at least once a month and hoses should be replaced whether you think they need it or not every year or two. Studies show that over 80 percent of all hose failures are caused by misuse or abuse of the hydraulic hose assemblies. If you notice that the hoses are kinked, crushed, pulled, or worn in any way, replace them immediately. You should also take steps to ensure that the same abuse does not happen again to the new Fall River hydraulic hoses after installation. It can be helpful to keep a log of all hose replacements. In particular, hoses that are replaced following a failure or another type of problem should be noted in your logs. You can gather data and use the information to help you estimate how long your hydraulic hose assemblies last in your current working environment. However, even when armed with this type of valuable data, you should continue making your monthly visual inspections and still replace old hydraulic hoses after a year or two. The more you can do to prevent a failure from happening, the better. This is the whole purpose of schedule inspections and regular hydraulic hose replacement. When you perform an inspection of your hydraulic hose assemblies, make sure to look for specific issues that have the potential to become big problems. 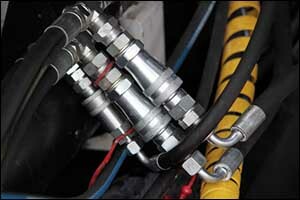 Hoses that are crushed or that have oil leaking around the fittings should be replaced right away. Stop using the equipment immediately and get brand new Fall River hydraulic hoses. If there is any significant damage to the outer layer beyond minor scuffs and nicks, make sure to replace the hose right away. Small abrasions should not be overlooked. Hydraulic hose replacement should still occur as soon as possible to avoid contamination or corrosion, which could cause internal damage to your equipment. Other things to look for include kinks, which could indicate an improper installation or incorrect routing path of the hydraulic hose assemblies. If the bend radius is below the minimum that is specified by the manufacturer, make sure to consult your owner’s manual and safety guide to ensure that your hydraulic hose replacement is installed properly. Twisted hoses can also be an indication of a routing issue or the use of a swivel to accommodate the equipment requirements. Fittings that are cracked or corroded, especially if red rust is apparent, should be replaced right away. Minor white oxidation is normal and can be acceptable, but you should note it in your inspection log. If you need to replace old hydraulic hoses with new Fall River hydraulic hoses, make sure to stop by our shop in New Bedford, MA. We provide services to customers all throughout Southeastern Massachusetts and ship to customers nationwide and internationally. Our sales team can help you find the right hydraulic hose assemblies for your needs. If you have any questions about hydraulic hose replacement, give us a call at 508-996-8400.